Sylvia Shoal in Morrungulo is situated 140kms North of Inhambane amongst tropical coconut palms and within a comfortable stroll to the squeaky clean Mozambique beaches. Sylvia Shoal reef is well-known as one of the world's finest diving spots. Explore the secret world of fascinating vibrant corals and other marine life including whale sharks and manta rays. The reef is approximately 14kms long - truly an amazing reef which has hardly been explored. 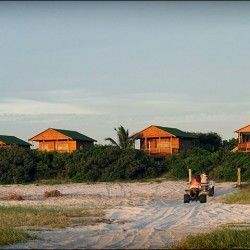 Sylvia Shoal offers budget accommodation for those who want to enjoy a Mozambique getaway, dine on an amazing array of seafood at the on-site restaurant, do some exciting fishing or experience some excellent scuba-diving. 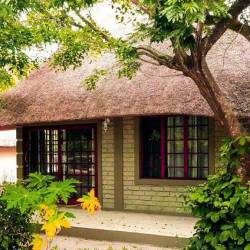 Guests are offered a choice of 2 or 4 sleeper bungalows which are equipped for self-catering purposes with linen, mosquito nets, cutlery, fridge/freezer and 2 plate gas cooker. The 2 sleeper bungalow comprises a double bed, table/chairs, kitchenette and private shower. The 4 sleeper bungalows comprise an open plan bedroom/lounge which has 2 sleeper couches, kitchenette and a private shower. All the bungalows have an undercover patio. The chalets are not serviced but cleaning staff can be arranged. The camp site is spacious and offers clean ablution facilities and generated power at specified times. Baraccas are available for hire. Guests are advised to bring own bottled water. Campers to please bring own mosquito nets and silent generators.